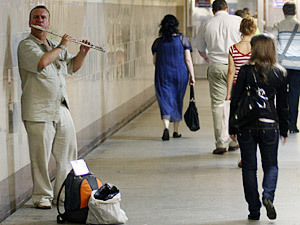 Russian Video: Musicians Moscow Metro! This entry was posted in Metro Collection, Moscow on November 10, 2010 by admin. Today we have photos taken by Svet and a video from Russia Today: Today is a day of mourning in Russia! Exclusive footage taken right after the explosion at Park Kultury Metro station. This entry was posted in Everyday Life, Explosion, Memory, Metro Collection, Moscow on March 30, 2010 by admin. Today we will watch an incredible cartoon: “Moscow Metro in stop-motion”. That’s so nice, cute and deep – I just don’t have words! This entry was posted in Cartoons, Metro Collection, Place to visit on November 2, 2008 by admin. Russian Video: Beautiful Moscow Metro! We recommend to read these articles in our main blog. This entry was posted in Metro Collection, Moscow, Place to visit on August 18, 2008 by admin. This entry was posted in Metro Collection, Moscow, Place to visit on January 6, 2008 by admin.